When you say “British hi-fi”, you automatically think of Linn, Naim, Rega, Cyrus, Creek – companies that came to the fore in the nineteen seventies and eighties. For older audiophiles, the names that acquired their cachet in the sixties like Quad, SME, KEF, Leak and Wharfedale will also figure prominently. But what of Britain’s lost hi-fi brands, the ones that fell through the gaps to obscurity and even ignominy? Most people will have forgotten this – if they even knew it in the first place – but Britain had a thriving mass market audio industry in the seventies which seemed to fizzle out by the beginning of the next decade, with names like Amstrad, Bush, Van der Molen, Wyndsor and ALBA. A J Balcombe Ltd was established in Worship Street, London way back in 1917 to manufacture gramophones. Alfred Balcombe subsequently began to make radios and televisons under the ALBA brand name in at 50-52 Tabernacle Street, London, EC2. The company even distributed American-made Crosley Shelvador refrigerators in the nineteen fifties, and by 1962 was selling an electric toaster. In 1974, now called Alba (Radio & Television) Ltd., the company moved to Bull Lane, Edmonton, North London. By 1982 it was all over, the company going bankrupt and its name bought by Harvard International. In 1987, Harvard became a public limited company, named Alba plc. This included the Bush, Hinari, Harvard, Roadstar and Goodmans brand names, but of course had no real link with AJ Balcombe Ltd. 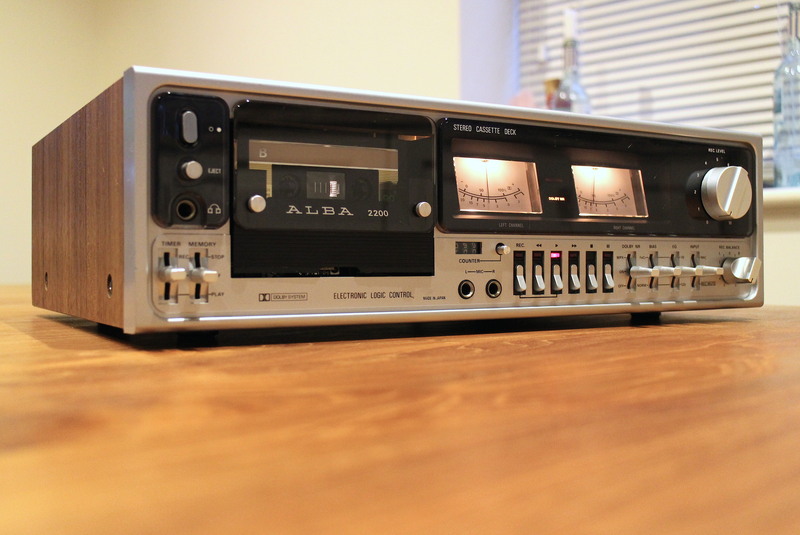 This 2200 cassette deck is late period ALBA, launched in 1977 when the company was making affordable hi-fi separates for a burgeoning market. Surprisingly perhaps, it’s actually a good machine. Built in Japan by Matsushita (Technics) to ALBA style, its slightly tacky fake woodgrained case and silver painted plastic fascia disguise the fine quality of the internals. An interesting little curio then, 2200s turn up secondhand for pennies now and again, normally requiring only a new set of drive belts to get working again. Before buying, check the record/replay head isn’t unduly worn, and that the motor doesn’t rumble too much. It’s a testament to the inherent quality of this deck though that there are still examples around at nearly forty years old giving good service – something you won’t be able to say of an Apple iPhone! Find a decent example of this ageing ALBA and you’ll have a wee piece of British hi-fi history.